On 11 July, VSI has lowered the alert level or Merapi from 4 to 3. The eruption of Merapi is increasing in intensity and has claimed the first deaths: Two people were killed on Wednesday 14 June, 2006, by a particularly strong pyroclastic flow that reached the area, travelling almost 7 km from the summit. The two men managed to run into a shelter at the village of Kaliadem, east of Kinahrejo near Bebeng, on the SE flank of the volcano, but were trapped inside because flow covered the shelter with about 2 meters of hot deposits. Although they survived for a while, the heat of the deposits effectively baked them to death. Recue workers tried for over 24 hours to free them, interrupted only when new pyroclastic flows were theatening to reach the area again. When the shelter was dug out free, they could only find the dead bodies. The flow also damaged some buildings, which is the first time, the eruption affected structures and villages as well. Visual observation o­n 14 June 2006: a gas and steam plume rises from the summit to about 500 m height. Kaliurang observatory reported a pyroclastic flow event at 08.14 WIB. It slided toward the head of K.Gendol. Continuous pyroclastic flow occurred afterwards, within 11.33 - 15.15 WIB toward K.Gendol, reaching 7 km from the summit. Ash fell at all observatories at the evening which has maximum thickness of 5 mm at Desa Krinjing, Dukun Regency, Magelang. O­n 14 June 2006, seismic recording noted 89 events of multiphase eqs, 371 events of avalanche eqs, 61 events of pyroclastic flow, and 2 events of tectonic eqs. After less than 24 hours, the alert level of Merapi volcano has been raised back again to the highest status of 4 on June 14, 2006. The decision followed a marked increase in activity with more frequent and longer pyroclastic flows travelling up to 3 km down the SW and SE flanks of the volcano. Merapi has quieted down a bit after part of the lava dome collapsed on Friday evening. Less numbers and smaller pyroclastic flows have been recorded since the event that removed approximately 1/3 of the lava dome. As a result, VSI has downgraded the alert status from 4 to 3 on 13 June 2006 at 11.00 WIB. Volcanic activity at Merapi continues to increase gradually since the earthquake of 27 May 2006, with the growing lava dome shedding glowing lava avalanches and pyroclastic flows that increase in number. Since the 27 May 2006 earthquake, the growth of the lava dome has been about 100.000 m3/day. On 7 June 2006, the height of the new dome was about 112 m and it had reached a volume of almost 4 million m3. Another change concerns the direction of the rock-falls and pyroclastic flows. Since the earthquake, pyroclastic flows were directed mainly towards Gendol valley on the SE, while most of them flowed through the Krasak valley on the SW before the earthquake. The repeated avalanches and pyroclastic flows entering Gendol valley caused caused the collapse of the older Gegerbuaya lava dome on 4 June 2006 at 18.03 local time. The collapsed volume is about 400.000 m3, and the collapsed triggered a pyroclastic flow in the Gendol valley as far as 4 km. The areas most at risk from pyroclastic flow remain the valley of Gendol, Boyong and Krasak in decreasing order of risk. Aerial observations on 7 June 2006 suggested that pyroclastic flows into Gendol river might develop a tendency to turn right when they collide with Kendil hill, whereas the possibility that they change their direction towards Woro valley is very small. Merapi continues to be in an elevated state of activity; the dome continues to grow and shed pyroclastic flows of small to moderate size (up to 3-4 km) down its SW and SE flanks. It now over 100 m high and an estimated 150-200,000 cubic meters are added per day, reduced by the volume of the pyroclastic flows. The risk of a major dome collapse increases. Authorities are warning residents to enter the 7 km exclusion zones, and try to forcefully evacuate some of the most exposed areas. After a period of heightened activity during and following the 27 May, 2006, earthquake that took more than 6000 lifes in the Yogyakarta area, Merapi continues to emit glowing avalanches and pyroclastic flows travelling up to 2-3 km from the summit. The Alert Level at Merapi remained at 4, the highest level, during 24-30 May. On 24-25 May, lava flows were observed moving SW towards the Krasak River and SE towards the Gendol River. According to news reports, on 27 May a M 6.3 earthquake that killed about 5,400 resulted in a three-fold increase in activity at Merapi. According to CVGHM, an M 5.9 earthquake coincided with pyroclastic flows of unknown origin that extended 3.8 km SW toward the Krasak River. During 28-30 May, multiple pyroclastic flows reached a maximum of 3 km SE toward the Gendol River and 4 km SW toward the Krasak and Boyong Rivers. Gas plumes reached a height above the volcano of 500 m (11,300 ft a.s.l.) on 25 May, 1,200 m (13,600 ft a.s.l.) on 26 May, 100 m (10,000 ft a.s.l.) on 29 May, and 900 m (12,600 ft a.s.l.) on 30 May. Activity at Merapi has been declining over the past days, although the lava dome is still active and probably growing. The summit of the new dome is higher than the previous summit of Merapi, whose total height now must have reached 3000 m. During the last nights, we observed no true pyroclastic flows, but frequent small to medium avalanches of glowing rock, travelling up to about 500-700m down two narrow channels on the S and SE sides. After a peak in activity on Monday 15th, when pyroclastic flows were produced that reached 4 km from the summit, the volcano has quieted down a bit, but still produces pyroclastic flows travelling 2-2.5 km length. The lava dome of Merapi is estimated to 2.4 million cubik meters volume and growing at a rate of about 150000 cubic meters per day. Most inhabitants in the immediate vicinity on the S and SW of the volcano have been evacuated and the volcano is closely watched by scientists and media. Part of the Volcanodiscovery team is now on location and will send further reports soon. The alert level for Merapi has been raised to the highest level 4 ("RED") at 8h30 local time, meaning that volcanologissts expect a major eruption imminent and advise to authorities to immediately evacuate a number of areas most likely to be affected by pyroclastic flows. Some small pyroclastic flows have already been reported on the south flank. Authorities are preparing for mass evacuations of 30-40000 people, while many residents are already leaving some of the most exposed areas. On the other hand, a greater number is still reluctant to leave their homes. From the Jakarta Post: "Vice President Jusuf Kalla called on local administrations to immediately evacuate residents living near the slopes of Mt. Merapi. "I am calling for the immediate evacuation of at least 50 percent of residents from danger areas," Kalla said after a closed-door meeting with officials from local administrations around Mt. Merapi. The meeting was held in the Central Java town of Magelang. Some 30,000 residents would have to be evacuated from Mt. Merapi if the volcano erupts" (Comment: or, alert is raised to 4, the highest level). 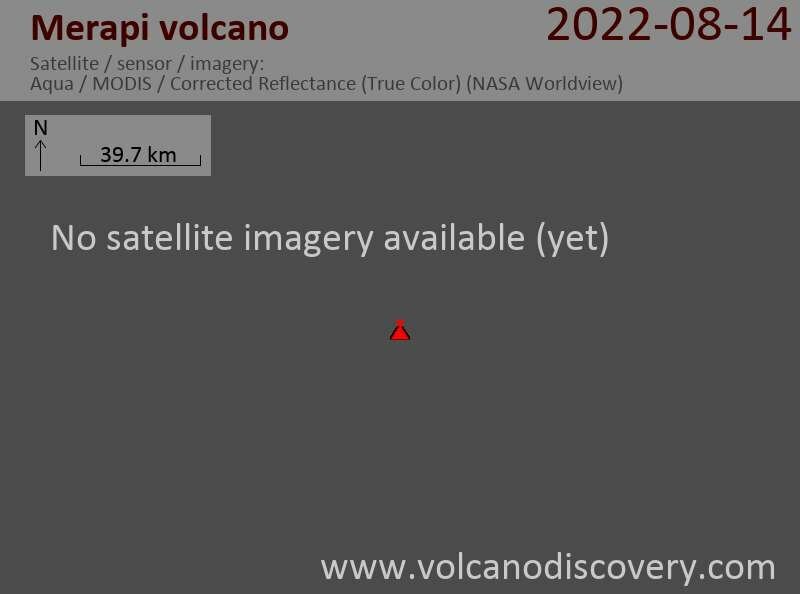 An eruption is considered imminent. The lava dome continues to grow at the southern sector of the crater and the danger of proclastic flows by dome collapse increases. A plume of gas, sometimes accompanied by ash emissions rises 500-800m above the crater. The most endangered areas are thought to be Klaten and Magelang. A lava flow emerging from the new growing lava dome at Merapi volcano has been reported. The dome has an estimated volume of 2.4 million m3, comparable to the situation in 1992. VSI warns that collapse of the dome could produce pyroclastic flows travelling up to 8 km into the valley of Gendol, Boyong and Woro, comprising an area with over 25000 inhabitants in more than 80 villages. Evacuation of people and lifestock (with markings applied to animals showing their owners) continues at elevated speed. A new lava dome is forming at Merapi volcano, reinforcing indications that it may soon erupt, as scientists believe. The new dome has been expanding since last Wednesday behind the older dome that was formed in 1997. Mount Merapi started to show first signs of fresh magmatic actiovity, erupting a small amount of ash on Friday 28 April 2006. The alert level remains at its second highest level and volcanologist think that a major eruption is possible in the near future. Merapi volcano is getting more and more restless, as authorities are trying to prepare for an evacuation of possibly several tens of thousands of people living in villages near the volcano. Merapi is currently at the highest alert level before an eruption (3 out of 4, with 4 meaning a significant eruption in progress, 3: imminent eruption likely). Our correspondant in Yogya reports that spectacular, incandescent rockfalls from the lava dome have increased in frequency and size although there haven't yet been any explosions on the summit yet: The lava dome still seems quiet, and an increase in steam and gas emission has been noted. Merapi volcano might erupt in the near future, the Volcanological Survey of Indonesia believes. The number of earthquakes below the volcano and steam emission from the summit crater have drastically increased during the past days. VSI raised the alert level to 3 ("an eruption could occur any time") and villages around the volcano are advised to be ready for possible evacuation should the volcano erupt. Merapi volcano might be becoming more active.The volcano's seismic activity has increased during the past days, and the Indonesian Volcanological Survey has raised the alert level from 2 to 3 (second highest level).